I managed to finish the lap blanket for my mom by Christmas day. 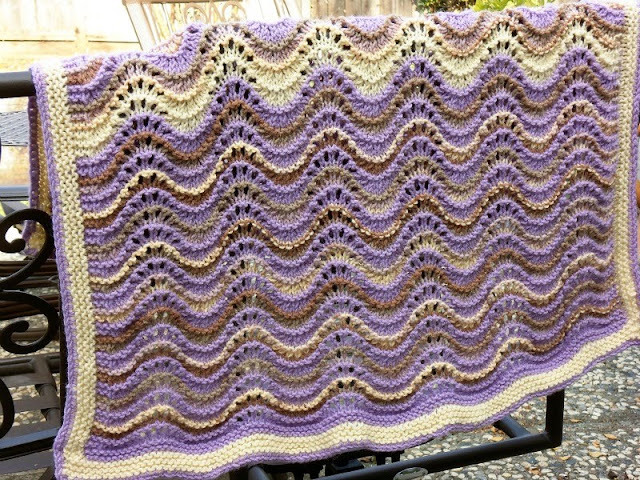 It doesn't exactly look like the scratchy purple afghan my grandmother knit in the 1970's like I was shooting for, but it does have a retro essence. I washed it with tons of fabric softener to make it soft and nice-smelling. This blanket features a garter stitch border with picked-up stitches, plus a final single crochet edging. The reason I did this is because I realized halfway through knitting it that it needed a bit more width. I wasn't about to frog the whole thing and start over, so when I finished the body of the blanket I added the borders and they actually worked beautifully, adding extra width and heft plus a nice finished look. 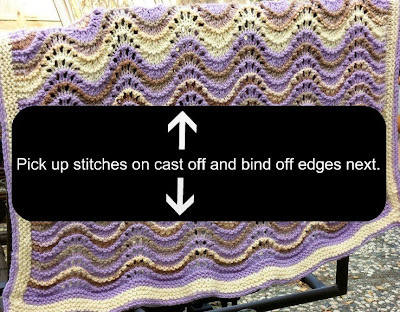 If you don't want to add the borders, when you begin the blanket you could cast on more stitches to make it wider. Keep in mind that the feather and fan lace pattern is an 18-stitch repeat, plus there are three selvage stitches on each side. So, instead of casting on 114 stitchs like the pattern calls for, you could cast on 132 stitches, which would give you one extra pattern repeat on each row while continuing to have three selvage stitches on each side. If you want to cast on less stitches than that, the extra stitches could be added to the number of selvage stitches on each side rather than increase the number of pattern repeats. Plymouth Yarn Encore Worsted. Five skeins: one champagne (#218), two light lavender (#233), two variegated brown and lavender (#7149). You will have leftovers of each color. Cast on 114 stitches in lavender. Rows 1 - 3: Knit. Row 5: K3, purl across row, end with K3. Throughout the entire blanket you will maintain the three selvage stitches at the beginning and end of each row. Row 6: K3, *K2TOG three times, (K1, YO) six times, K2TOG three times*, repeat across row, end with K3. Repeat rows 4 - 7, changing colors every four rows. I carried the yarn up the side to avoid having to weave in tons of loose ends. I also added a random four row repeat in champagne roughly in the middle of the blanket ... just because. Continue the four-row repeat until the blanket reaches the desired length. End with the four-row repeat in lavender, knit thee rows in lavender, and then bind off. In champagne, pick up 79 stitches along the edge of one side (a non-cast on or bind off side) and knit five rows in garter stitch. Bind off. Do the same for the opposite side. In champagne, pick up 102 stitches along the cast-on edge and knit four rows. Bind off. Do the same for the opposite side , which is where you did the bind off. 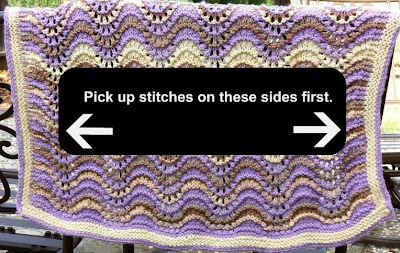 In lavender, do a single crochet border around the entire blanket. I machine washed my blanket and then blocked it on a towel on the dining room table. The pattern looked much more defined after blocking it, plus the little mistakes I made seemed to blend in better. Stacy, it came out just perfect and I am sure your mom is enjoying it. I am glad to hear you had a great holiday and I am with you about it all going so fast. Happiest of New Year's and I look forward to visiting here in 2012! Beautiful! I know that your Mom is enjoying snuggling with this gorgeous gift:) Have a blessed day dear friend, HUGS! I love how this came out! There are very few nice patterns for knitting blankets out there right now, this one is by far one of my favorites! Your blanket/afghan is gorgeous. I LOVE the colors. 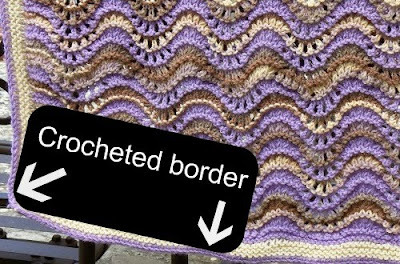 I had another idea for the border, I don't crochet and hate picking up stitches. Couldn't a few extra stitches be added at each end of pattern? For top/bottom, knit a few extra rows? Just my idea. Hope you don't mind. Happy New Yr and Happy Knitting. I love the colors you used for your Mom's lap blanket! How was the little Lily's first Christmas??!! It's beautiful! I hope that you are well! Thanks for sharing the pattern Stacy -- it's just beautiful! I'll bet your Mom just loved it -- especially since it was from You! Did I tell you how much I love this blanket. Feather and Fan is the best stitch. I'm such a blocking fan - it just makes everything look great and hides all but the most glaring mistakes. What a fun retro blanket and I liked how you did the border! I absolutely adore this pattern! I'm in the middle of knitting it up. :) I would absolutely love to feature this pattern on my blog, if it's okay with you. Of course, I will give full credit to you. I'm not in the habit of crediting people with a single line at the bottom of an article. It's usually more substantial than that. Let me know if this is okay with you.